The reason why we never get anything done is common- a lack of time! There's never enough time in the day to get the necessary chores done, so how can one possibly find the time to do a project or two around the house? Well, not all projects will occupy your entire weekend, and indulging in a mini project or two can be extremely therapeutic. I think we all can prioritize to find an hour or two. And if you do find some time, here are some quick and easy painting projects that will make a big difference! 1) Update your a piece of furniture with some paint! 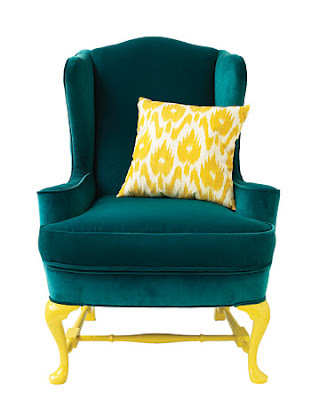 You don't necessarily have to re-upholster an entire chair, but try painting the legs only. Use a high gloss in a bold color to add sudden impact, and then inject the color again by adding a matching throw pillow. 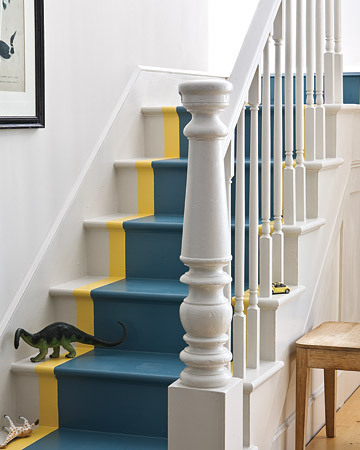 2) Paint a runner on your staircase. This one may sound a bit timely, but really, once the area is taped off, you can cruise along with your brush and roller to be done in no time! Again, choose an unexpected color, and frame it with a complimentary color to create an instant focal point. Or choose a color palette that will tie in the upstairs to the main floor for seamless transitions. 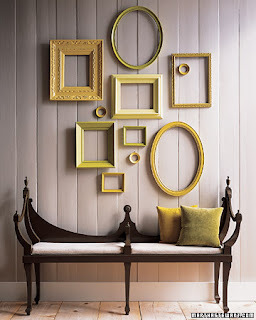 3) Collect a diverse group of picture frames and spray paint them to create a uniform arrangement. And then hang the frames with or without art.